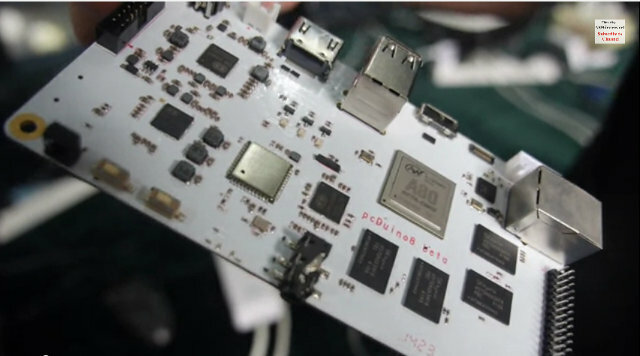 Two AllWinner A80 powered development boards are currently expected. We’ve already seen some pictures of the Cubieboard8, and today we can gt more details about PcDuino8 development board thanks to Charbax who visited Linksprite, and interviewed the company. The hardware specs are a bit lower compared to the Cubieboard8, notably when it comes to RAM, and USB ports. LinkSprite is currently working on Android and Debian for the board, but they also said some developers are also working on Chromium OS. The board is expected to be available next month, and they hope to keep the price below $100. A version of Scratch for PcDuino board with an hardware tab to program GPIOs using the program’s graphical user interface. Quick talk with the developer of Papilio DUO FPGA board, as it happens to be manufactured by Linksprite. Yes, you’re right! I forgot about that one. On video i can see SATA port but its missing in description. So what is deal here? A80 doesn’t advertise SATA port..
Ok i watched video and its not there. Its just youtube video titile screen with SATA. Well no A80 for me for sure..
Are they in Shenzhen? I can film them also if they are here. Are you inviting me to Bulgaria so I can film the Olimex board offices? The Youtube preview image is probably one they did a few months ago where an image of the A80 is simply put onto a photo of their old board. It’s a big let-down that the A80 has no SATA interface. And the PowerVR GPU could be a problem with drivers.